Garrett Juice is a concept as much as a product. It evolved over a period of years as I explained to readers and callers how to make an effective organic foliar feeding mix. The mix has always had compost tea, molasses and seaweed, but the other ingredients have varied. Through trial and error, we came to the basic mix we use today. The current formula is a well-balanced blend of plant nutrients and food for both beneficial fungi and bacteria. 2 ounces of orange oil per gallon of Garrett Juice. To avoid burning plant foliage, the ready-to-use insect control solution should not have more than 2 ounces of orange oil per gallon of spray. 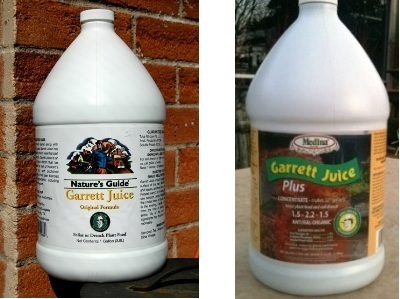 Garrett Juice Concentrate: Mix the following: 1 gallon of compost tea or liquid humate, 1 pint liquid seaweed, 1 pint apple cider vinegar, and 1 pint molasses. To make Garrett Juice Plus add 1 pint fish hydrolysate. Use 1½ cups of the above ingredients per gallon of water for the ready-to-use spray.